Most of the time, there is no real trick to introducing the rescued dog to your existing dog pack, whether it be one dog or more. Most rescues fit right in without a lot of fuss and bother. This is especially true if the rescue dog is naturally a “beta” dog. Unfortunately, rescue dogs are often “only” dogs and haven’t had a lot of experience with other dogs. Sometimes these dogs go into foster care and their “personality” can be determined. But sometimes even foster care does not tell us everything because it isn’t just the personality of the rescue dog that determines how he/she will fit in to the new family but also the personality of the existing dog. I’ve seen dogs who I would say are normal, low key dogs change completely when they meet a certain new dog whose personality just brings out the worst in them. So, there is no guarantee on how this new pack member will work in. There are things you can do to make it more likely to work. If things were going to work out anyway, this won’t hurt and if things were going to be difficult, following these instructions from the very start might help you avoid a bad situation. For ease of discussion I will address these issues as if we are introducing one new dog to a single existing dog. The instructions can be used for larger packs but will, of course, have to be somewhat modified. Hopefully, from the time you got your first dog, you have worked to socialize this dog with others. If not, perhaps it is best to start on that immediately, before there is another dog in your near future. Start setting up situations for your dog to meet other dogs. The easiest situation is to take him to a basic obedience class. In this setting he will see lots of other dogs in a controlled situation and, if there are problems, you will have an experienced trainer there to help you. Take your dog for walks where he will see other dogs and possibly meet them. Many people are willing to let their dog meet yours while they are out walking. Take your dog to visit friends with dogs. Don’t do this once a month. Do this once a day if possible or at least 2 or 3 times a week. Let the dogs play and get to know each other. 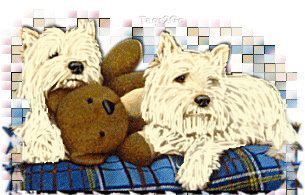 Now, when you know your dog does well with several other dogs, this is the time to consider adopting a Westie. Is your dog crate trained? This will be very helpful to you if your dog does not fight going into a crate. If you haven’t been using a crate, consider buying one and training your dog to the crate before the new dog comes along. If you have time before the actual adoption takes place, do some sharing of smells. Give the rescue dog a towel with your dog’s smell on it. And give your dog a towel with the rescue dog’s smell on it. Put the towel on the floor so they can get used to that smell. (Do NOT put it in the crate or in areas they consider their personal territory.) If you can do this 2 or 3 days before the adoption, it will really help them. It is always best if the two dogs meet for the first time on neutral territory. That way, no one has a need to defend their territory. Meet in a park for the first time. Have both dogs on leads. Let them sniff and play. KEEP THE LEASH LOOSE!! If you put tension on the leash, you will pass that “tension” on to your dog. A loose leash lets the dog know you are confident and that all is well. He will, in turn, not be worried. Remember that when terriers play, they often growl. This doesn’t mean they are about to fight. If they are playing and growling begins, it is just part of the play. BUT it may be a signal to you that they are getting wound up and it might be a good time to separate the dogs and let them settle down before beginning another play session a minute or two later. Once it is clear that they are getting along, it is time to take them home. When you arrive home, let the dogs meet again OUTSIDE. Let them sniff and reacquaint themselves with each other. Then you can enter the house. The new dog might well want to explore the house. Let him see the other rooms and sniff around. Let the other dog go along. You also go along with them but don’t be too obvious about it. You want to keep an eye on them but not interfere unless it is necessary. You don’t want the two dogs to get into any small, enclosed spaces together. It is too soon for that. Don’t let them go under a bed. Let them explore but keep them out of trouble. You may read advise about letting the dog(s) drag their leash for a while so that you have a “handle” on them. This is probably NOT a good idea. If one dog accidentally steps on the other dog’s leash, it may be viewed as aggression. Even if one dog accidentally gets his leash caught, he may blame the other dog rather than the leash. Set up the new dog’s crate right away. Make sure it contains things that are familiar to him, like a toy. Make sure that each dog knows their own crate. Over the next month, the dogs will be getting adjusted. It can take as long as a month for them to settle in. During this period there can be a lot of things happening that won’t happen long term. There can be housebreaking accidents. Some dogs won’t have any at all. Others may need to almost be “retrained”. Most will be somewhere in the middle. Some dogs may try to mark. These are all issues that need to be dealt with right away (but after the initial day of meeting). During this period of adjustment, you have one major goal. Your goal is for both dogs to learn that “good things happen when we are together and getting along”. When we are alone or don’t get along, “the good things go away”. When your dogs are together and doing well together, give them lots of attention. Praise them and pet them. Give them a treat. It is easy to forget to reward when the dogs are getting along. When they are laying on the floor and not fighting, occasionally give them a treat or attention just for being good dogs!!! Don’t react only when they are “bad”. When your dogs start to spat, withdraw all rewards. You may use their crates for time outs. If they begin to growl, put BOTH dogs into the crates. Don’t fuss and scold. Just put them into the crates. Don’t make any value judgements about which dog is at fault. You are a human. You are missing many, many doggie signals. The culprit may be the dog who didn’t growl but started the spat by giving the other dog a challenging stare. The point is, whatever you do, you do to both dogs. Good things happen when they are together and being good. Not when they are separated. When you give them a time out, make it 2 minutes or whenever they settle down. Another thing you can do is to offer “Calming Signals”. Calming signals are words that you use such as “easy now” or “settle down”. These words are spoken in a calm voice. This can be done when you anticipate a situation that could create an issue. For example, as you are handing out treats, you can say “be nice”. This is a reminder to them in a situation where they are excited and could accidently bump each other or one dog could view another dog as “stealing his food”. Calming signals can also be used when an actual situation starts to build. When you see that something is starting to happen, you can say “settle down” or similar words. If things still escalate to a point where you need to give a time out, go ahead and do it. But now they are hearing these words as things start up. Eventually, they will make a connection and those words will start to be as effective as a time out, and will eliminate the need for most time outs. Keep in mind that until the new dog has settled in and found his place in your “pack”, your first dog is the natural “alpha”. You need to “support” him/her in that role for a time. This means giving “your” dog the first treat, letting “your” dog out the door first, etc. After they have settled in together, you may find that the new dog is taking over as “alpha”. If that happens, let it happen and support their choice at that time. If they want to sit next to you, let one sit on each side. Most of you have two hands and arms. One can be petting or even just laying on the back of each dog. Good things happen when they are together!!!! If you have to give them timeout after timeout, do it. Do it without fuss and don’t make it for long periods. If they growl upon leaving the crate, put them BOTH right back into their crates without comment. They will learn!!! No matter what you do, there is always the possibility of a fight. Dogs are pack animals. It is important for a pack to establish their “pecking” order. It is hard for us humans to keep our values out of this process. If one dog is alpha and another is beta, you don’t need to feel sorry for the beta dog. He is happy being beta!!!! A beta dog has very few responsibilities. He is secure in knowing that he doesn’t have to run things. The other dog can make the decisions and the beta dog is happy with this. Don’t try to compensate for this. The dogs are happy if you don’t interfere!!! If you have two strong dogs, both who see themselves as alphas, you may have a fight no matter how hard you try to teach them to get along. If this happens, it is because it is a necessary thing. Before it happens, please take the time to thing this through and determine how you will react. If you think it through ahead of time, you are much more likely to handle it correctly. FIRST THING: STOP YOURSELF!!!!! Most experts will tell you that if the dogs are fighting but there is no blood, just let them fight it out. If you stop the fight, it will most likely occur again because they weren’t able to settle their issues. So, if you can, watch closely but allow them to fight it through. A terrier fight can sound like a terrible thing. These are small dogs and they will attempt to use their vocalization to intimidate each other. Unfortunately, this often intimidates their owners more than it does the other dog. It usually sounds much worse than it actually is. As a result, many owners simply can’t let them fight it out. And sometimes, the fight is serious and there is blood. In this case you need to interfere before someone is seriously hurt. Again….STOP!!!! Think about it. The human reaction is to reach in and try to pry the dog’s mouth off the other dog. Don’t do it!!! Your hands are absolutely no match for a terrier’s jaws. You can’t pry the dog’s apart. What you will succeed in doing is to get yourself bitten….probably by the dog who doesn’t have a grip. It won’t be intentional. The dog won’t even be aware that he bit you. But you will be bitten anyway. Your “yelp” might be the thing that stops the fight!!!! If you are seriously bitten, you will have to seek medical attention and, in many areas, that means your dog will be quarantined and will now have a record as a biter. There are better ways to handle a fight. Westies have a tail for a reason!! When they were working dogs, they were often sent down into a burrow to get an animal. Sometimes they would get down and not be able to get out. The farmer would reach in behind them and grab their tail to pull them out. This is why they don’t have a docked tail and why it is groomed like a carrot. It made for a good handle!! 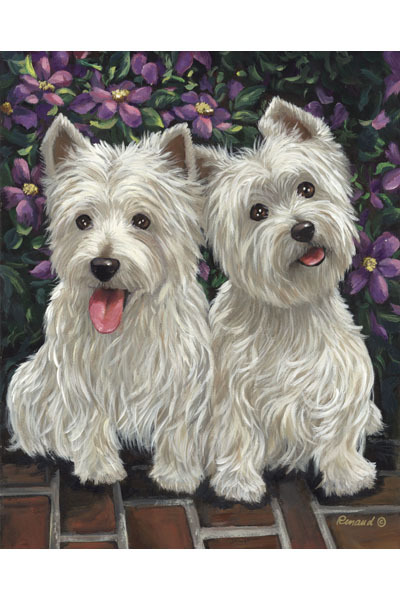 If your Westies are in a fight, grab a tail!!! This keeps you away from the business end of things and gives you a good handle on the dog. Now lift the dog in the air and dangle it. Once its feet leave the ground, most will let their grip go and concentrate on getting their balance back. If one of the dogs does not release its grip, you have another hand. Grab the tail of the other dog and dangle them both!! They aren’t big dogs. You can do this for a few seconds. While you are doing this, keep them as far apart as you can. Even if they don’t want to let loose, they can only hold on for so long. Usually this will end the fight immediately. If you are outside, a water hose will work wonders. Method 3 If you have a blanket handy, you can throw it over the dogs. It is hard to continue a fight when you are tangled in a blanket. No matter what method you use to break up the fight, when it is over, send the dogs into their crates. This will give YOU time to recover!!! Unless one is seriously hurt, do not baby either dog. They are dogs. The loser knows he has lost. Giving him sympathy or blaming the other dog, only confuses them both. This fight has helped them understand who is boss. If you now give sympathy to the one who lost, you are teaching him fear. And you are undermining all they learned from that fight, making another fight more likely. When you let them out again, let them both out. Take the dog who needs patching up and do what needs to be done without fuss!! Please be aware that a serious seeming fight at the start does NOT mean that they will never get along. Following are real cases where everything worked out and the dogs are living together happily. Scooter – Scooter was a fairly dominant dog. When he met his new brother the first time, his brother tried to mount him. Once or twice he warned, but finally he had had enough. There was a real fight. The brother had a blood wound so I interrupted the fight by picking one up by the tail. This stopped the fight immediately. When the brother was cleaned up, we found 3 or 4 small punctures. And a couple of days later, we realized that Scooter had a tooth hole right through his metal tag. If the brother’s aim had been better, he would have been the one to come out on top!!! The owner took all of this pretty well and didn’t go running to the door!!! Within 15 minutes, Scooter was walking around with his future brother behind him acting like he was saying, “Ok, I know who is boss. Let’s be friends.” On the next visits, the dogs got along well and the two dogs are living happily together now. Most dogs will settle in quickly and repeated fights are not going to happen. If they don’t seem to be resolving things, you might want to consider using a professional trainer. But there are some dogs who will never live well together. If this is the situation, you may be forced to make a choice. If you have done all you can to work through these issues and they are not able to live together, it should not make you feel guilty and it doesn’t necessarily mean that a different dog might not work out just fine. And the dog you must give up, may well fit in perfectly in a new home. Give them a fair amount of time before giving up; remember that the first fight might well be the only fight….but if you have done all of this and it isn’t going to work out, contact Rescue and give the dogs a chance to move on to a better life.